Saltgrass Steakhouse Boiled Shrimp and Avocado Salsa is a new appetizer you can find at the Saltgrass Steakhouse. So often it is really hard to pick out new recipes to do. You want something original and tasty. This salsa has the benefit of being much healthier than many other appetizers. Nothing is fried, everything is fresh. This is packed full of healthy ingredients that taste so good. One of the reasons that I love preparing copycat recipes is that you can add or take away ingredients that you desire. For this recipe you may want to add some extra shrimp in this dish. This dish receives its inspiration from Ceviche, but this recipe contains only cooked shrimp so no need to worry about eating fish that has not been cooked. I find additions such as calamari and even a little cooked crab meat go really well in this salsa. 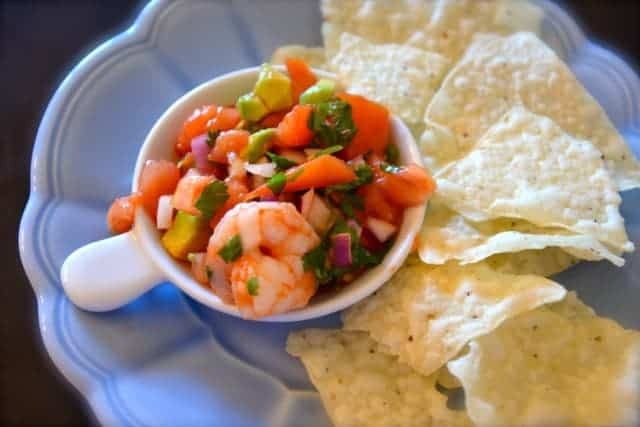 If you are looking for something nice and light whether it is to start out your meal or even a light lunch, this boiled shrimp and avocado salsa should fit the bill. Enjoy this light and refreshing Saltgrass Steakhouse appetizer, this cooked ceviche is a perfect way to start a meal. Boil shrimp in water just until shrimp turn pink. Remove from boiling water and allow, shrimp to cool. Chop half of the shrimp into small pieces. In a medium sized bowl combine tomatoes, red onions, yellow onions, chili sauce, cilantro, lime juice, jalapeno pepper, avocado, and salt. Stir to combine. Add half of the shrimp to the vegetable mixture. If desired you can place the remaining shrimp on top for decoration or you can stir all of the shrimp into the salsa. Serve with chips. Heinz chili sauce is sold in most grocery stores. It is sold near the cocktail sauce. Personally, I like to add extra cooked shrimp and avocado to this salsa. How much avocado? It’s not listed in the ingredients. This sounds delicious. This is delicious and refreshing!! Why is this called broiled shrimp, when they are boiled? I made a typo. Thanks.